This dog spent a short time with us. One day he was gone and we assumed was a dinner guest at some Vietnamese meal. War is tough on all life! 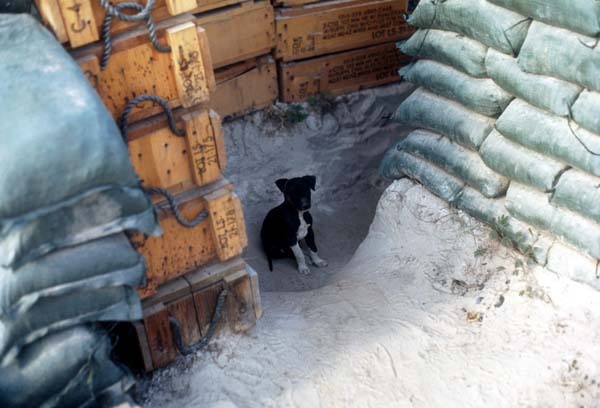 He is sitting at an entrance to our bunker; the bend is to keep shrapnel out should something explode nearby. The longer we stayed in a firebase, the more improved our bunkers became. This one has the look of luxury, and had been worked on many days. We used the dirt dug out for the bunker to fill sandbags; our way of recycling. The sandbags on the left do not look stable and I see extra duty ahead for someone.